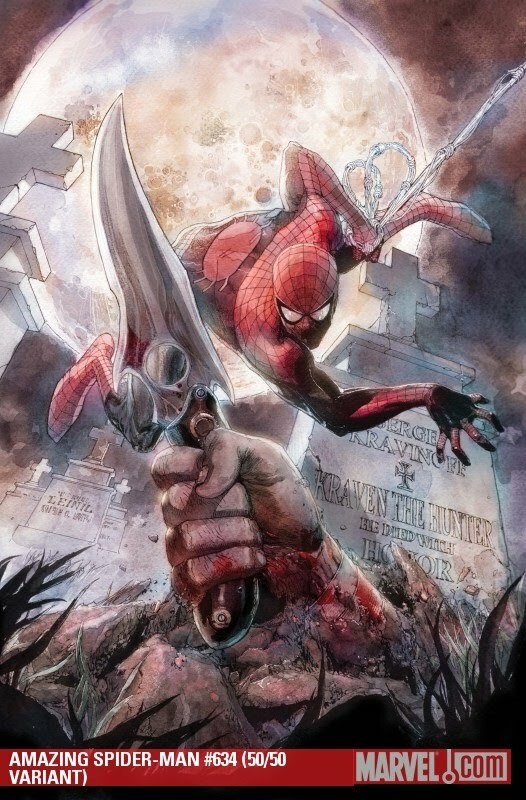 "The Grim Hunt" is the current Spider-Man story line which has finally begun with The Amazing Spider-Man #634. The building blocks which construct the comic of the day (and the rest of "The Grim Hunt") have been laid throughout The Amazing Spider-Man issues for seemingly a year now. So what is the event about? What does all of this foreshadowing and build-up lead to? Yep. "The Grim Hunt" is about a pack of lions versus a spider. Does that seem fair? Does it even seem entertaining? Cats are super curious when it comes to spiders. They paw at them, poke at them and hold them down by a leg or two. The spider moves in awkward ways that the cat doesn't quite understand or predict, but the cat remains in control with quick inquisitive paw batting. That's what the pack of lions known as the Kraven family has been doing in the Amazing Spider-Man stories over the last year. The Kravens have just been playing with the spider, but now, they go for the kill.